DIAMOND jewellery sales should grow between 2% and 3% in 2018 owing to high consumer confidence in the US and the emergence of a firm underpin in China, but a shift in attitudes towards jewellery would challenge the diamond market as never before. “Never before, we suggest, have natural diamonds seen such competition from other ‘luxuries’ ranging from electronic items to holidays,” said Des Kilalea, a diamond analyst for Canaccord Genuity in a report dated November 7. “The decline in diamond’s share of luxury spending, and the fall of diamond value in jewellery pieces needs to be reversed if rough and polished prices are to see any sustained upward momentum, in our view,” he said. 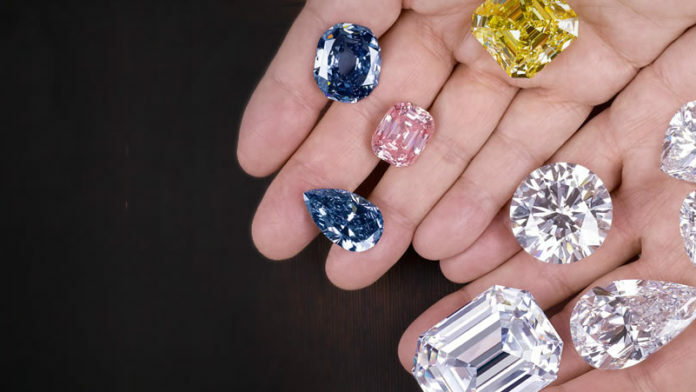 Once comprising 33% of the total value in diamond jewellery, diamonds are now 25% of total value today reflecting preference for smaller diamonds by younger consumers, or the preference for mixing diamonds with other gem stones, said Kilalea. The challenge posed to natural diamonds by laboratory grown diamonds could also hurt natural diamond sales. De Beers is reported to have cut the value of lower end diamonds at a recent ‘sight’ or sales meeting, one of ten per year arranged by the company, in Botswana. According to a report by Goldman Sachs, the price cut of this quality diamond was as much as 10%. It viewed the development has a negative for De Beers and Petra Diamonds. De Beers is 85% owned by Anglo American but the shares in Petra Diamonds, and another standalone diamond producer, Firestone Diamonds, have been under pressure all year. A third independent – GEM Diamonds – has performed well but – instructively – it specialises in recovery of large, high value diamonds for which the market is still reasonably strong. “After a firm trend in rough and polished prices in H1 2018, prices have retreated under the pressure of excess inventory, scarce bank credit to the midstream (partly driven by bankruptcies), still relatively high rough sales and prices from the majors, and the impact of lab-grown diamonds,” said Kilalea. Lucara Diamond Corporation, another diamond miner which has been under pressure lately, said it was increasing carats from its Karowe mine in Botswana but it acknowledged that the predominantly large proportion of lower value diamonds it would recover would “… not contribute materially” to its revenue line for the remainder of its financial year. The critical period for diamond jewellery sales was from Thanksgiving Day on November 22 through to Valentine’s Day in February, a three-month span of time that also included the Chinese New Year. “The US market remains buoyant and sales promise, we think, to be good for diamond jewellery with consumer confidence at a multi-year high,” said Kilalea. De Beers said on October 16 that it had sold an estimated $475m in diamonds in its eighth sight or ‘cycle’ of the year, a year-on-year increase of $99m. Sales reflected “… steady overall demand”, said Bruce Cleaver, CEO of De Beers Group. Sales in the eighth sight of 2017 totalled $376m. The sales number for the previous – seventh – sight of this year was $503m, however. Cleaver said sales of lower value categories had been impacted.